Qantas Airways aircraft at the Sydney International Airport. On Australia’s Qantas Airways and Germany’s Lufthansa, you can now sit in first class even if you hold a ticket for business — no miles or other upgrade instruments are necessary. Qantas also allows coach customers in the business cabin. The two carriers still offer standard three-cabin service on most of their international networks. 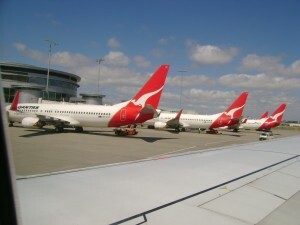 However, earlier this year, Qantas decided to stop selling first-class tickets on some routes where demand had slumped. While it pondered the wisdom of removing those seats, it made them part of business class. Since your boarding pass will say “business,” you won’t have access to first-class lounges, as well as other special ground and in-flight services and amenities. But the spacious and truly flat seat is what travelers value most on a long-haul flight. Most business seats, even though advertised as “lie-flat,” actually have a slight angle when fully reclined. Qantas also moved up some passengers with tickets in premium economy, which it sells as a separate cabin, to some of the business seats — although with coach meals and service. That opened up several premium-economy rows to standard coach fliers. Things were supposed to go back to normal earlier this fall, but the airline decided to continue the practice. “We have currently extended the [temporary] configuration until mid-February and are yet to make a decision about any further extension,” said Wally R. Mariani, Qantas’ senior executive vice president for the Americas. The routes on which Qantas has implemented its temporary no-first-class policy include Sydney to San Francisco and Buenos Aires, and Melbourne to Hong Kong and London. Those flights are operated on Boeing 747 aircraft. Last month, Lufthansa decided to follow Qantas’ example and stop selling first-class tickets from Dec. 15 until March 27 on flights from its main hub in Frankfurt to Osaka, Japan; Guangzhou and Nanjing, China; Kolkata, India; Accra, Ghana; and Libreville, Gabon. Unlike Qantas, the German carrier decided to replace several business rows with coach seats on about two-thirds of its Boeing 747 fleet earlier this year, rather than have economy passengers occupy business seats. That move is temporary, too, Mr. Riecken said. Virgin Atlantic Airways announced plans last week to do the same in January. Customers who hold first-class tickets on the affected routes “will be reimbursed for the difference in the fare” and can keep their preassigned seats, Mr. Riecken said. So how can you snag one of those coveted seats? Lufthansa has blocked the first-class cabin on the flights at issue, so if you have a business-class ticket, the only way to get one of those seats in advance is to be a top-tier elite member of the carrier’s loyalty program, Miles & More. At the airport, the rest of the seats “will be made available to other passengers on the basis of operational needs,” Mr. Riecken said. So make sure to ask a gate agent before boarding. Qantas seems less protective of its reassigned premium cabins. It blocks several seats in what would normally be first and business class, but you could get a seat there on a lower-class ticket without being an elite flier. It can be confusing because the same row is sold as business on one flight but as premium economy on another — even on the same route. So get access to the seat map and look for rows with fewer seats and as up front as possible. This entry was posted in Travel and tagged Accra, Airbus, airlines, Australia, Boeing, Buenos Aires, business class, China, first class, Frankfurt, Gabon, Germany, Ghana, Guangzhou, Hong Kong, India, Japan, Kolkata, Libreville, lie-flat seats, London, Lufthansa, Melbourne, Nanjing, Osaka, premium economy, Qantas, San Francisco, Sydney, tickets, Travel, travelers, Virgin Atlantic. Bookmark the permalink.